I love, love, love the store Anthropologie. It inspires me so very much every time I walk inside... And I am seriously obsessed with their book collection. I saw Design Sponge at Home in Anthropologie, and was initially drawn to it because of the color (tangerine is my favorite interior accent color at the moment). I purchased it after flipping through, and realizing that it was more than just a pretty cover - but it is just as inspiring as the store it's sold in! 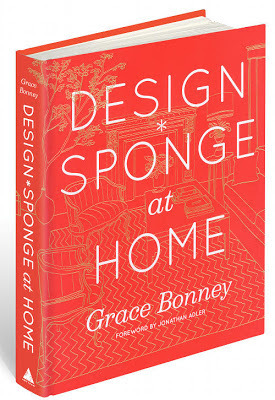 Design Sponge is a blog started by Brooklyn-based writer Grace Bonney. She compiled her favorite homes and DIY projects, and put them into this very well-designed, gorgeous hard-back book. I'm so excited to begin a Do-It-Yourself project that is featured in Design Sponge at Home. I'll take some photos of the final product and post them here. You can find some fun DIY projects on the Design Sponge blog. I highly recommend this book to anyone in love with interior design or DIY! You can purchase the book at Anthropologie, Amazon (it's a lot cheaper there), and more.